Announcing a revolutionary advance in polyphonic tuners that will shorten your tuning time! The Pitchblack series of high-performance pedal tuners bring together Korg’s legendary tuner accuracy, versatility, and reliability – along with easy-to-see displays and stylish diecast aluminum bodies. 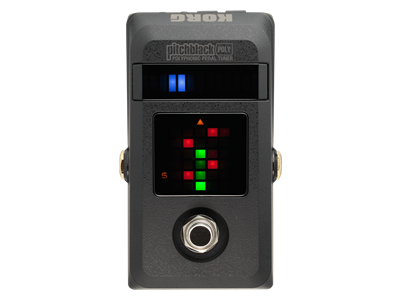 Now, the remarkable Pitchblack Poly adds the convenience of polyphonic tuning to the acclaimed Pitchblack pedal tuner line-up. Offers quick and easy high-precision polyphonic tuning. Displays the tuning status of all strings at once. Two-way power; operates on 9V battery or 9V DC input. The Pitchblack Poly features Korg’s revolutionary polyphonic tuning. Simply strum your guitar; the Pitchblack Poly will show which strings are in tune and which strings are out of tune, all in a single glance. Tuning with a traditional tuner required checking every string, one at a time – including strings that may have been perfectly in tune. Using the Pitchblack Poly’s advanced polyphonic tuning, you can quickly see which strings are out of tune and adjust only those strings, saving time and letting you get back to playing quickly! Guitar or bass (up to 6-strings) use is detected automatically, so there’s no need to change settings. Strumming the guitar displays the tuning status of every string, making it easy to see which string is out of tune. 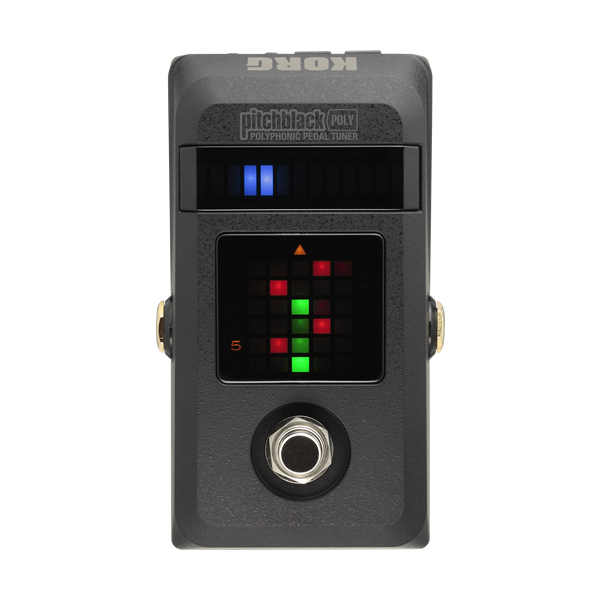 Simply turn the tuning peg for that string, and the String Seeker feature will automatically detect the string you are adjusting, and instantly display its tuning status in the large meter located in the upper part of the Pitchblack Poly. In addition to ensuring that you’ve tuned each of the out-of-tune strings, this convenient design also allows stress-free tuning even for those using a polyphonic tuner for the first time. While tuning, the Pitchblack Poly completely mutes the audio input. When not tuning, the incoming audio signal is sent directly to the output without being affected in any way by the tuner circuit (true bypass). Even when the Pitchblack Poly is connected between several of your favorite pedal effect units, the input will simply be directly output without passing through any buffer amp, ensuring that the sound you’ve created with your effect units will be uncolored. The Pitchblack Poly is designed to play nicely with your other effect pedals. The Pitchblack Poly is sized like a pedal effect unit, and will conveniently fit into most effect pedalboard systems. In addition, Pitchblack Poly also provides a DC OUT jack that can be used to feed power to other effect pedals (when using the optional AC adapter). With a dedicated power supply circuit for the DC OUT, this jack is able to provide a stable and noiseless power supply (9V 200mA) that’s equivalent to a dedicated effect pedal power supply. By connecting a commercially available DC cable, you can supply power to multiple effect pedals, allowing you to simplify the power connections in your pedalboard. Regular Meter mode: As when using a needle-type meter tuner, tune the string so that the white LED in the center of the meter is lit. The illuminated LED will move to the right if the string is sharp, or toward the left if the string is flat. Full Strobe mode: Tune the string so that the LED meter illumination stops flowing. The illumination will flow from left to right if the string is sharp, or from right to left if the string is flat. Half Strobe mode: Tune the string so that the LED meter illumination stops flowing and only the center white LED is lit. The right side of the LED meter will strobe if the string is sharp; the left side if the string is flat. When the pitch is correct, only the center LED will be lit. Split mode: This mode is a first for the Pitchblack series. It’s a hybrid of Meter mode and Half Strobe mode. Tune the string so that the lit LEDs at left and right converge in the center. If the string is sharp, the right side of the meter shows the amount of the discrepancy, and the left side shows a half-strobe display. If the string is flat, the left side of the meter shows the amount of the discrepancy, and the right side shows a half-strobe display.